My name is Hazel Shimmin. 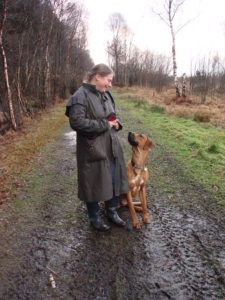 I am a Kennel Club accredited and MSc qualified dog trainer and behaviour advisor with decades of experience. I’m passionate about my work with dogs and actively study and research into dog related subjects and continue to take further qualifications. I worked in a land based college for 19 years as a lecturer and manager. This work enabled me to share my passion for dogs with a wide variety of owners and students and gave me the opportunity to work with many dogs from all sorts of backgrounds. The combination of both practical hands on training and behaviour work and delivering higher level theoretical lectures enabled me to further enhance my experience and knowledge. Completing this qualification gave me a structure on which to base my own studies and broaden my areas of expertise through extensive reading, attending seminars, undertaking short qualifications and working with other trainers and behaviourists. For more information about Kennel Club qualifications and the Kennel Club Code of Practice see Kennel Club Accreditation. In 2014-16 I undertook a MSc in Applied Animal Behaviour and Welfare at Newcastle University and received a Distinction. I took the behaviour route and specialised in dogs. My dissertation studied the development of behaviour problems, particularly in adolescent dogs. If you would like to discuss dog training or need dog behaviour advice, please Email me.